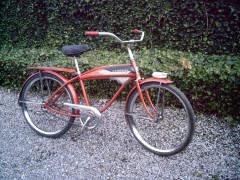 All original JC Higgins/Sears bike except for the chain guard. Even “sears” tires are in good condition! 24 inch wheels. The headlight is an NOS accessory. I think it’s maybe missing the chrome bars going from the center front wheel towards the steering ??? 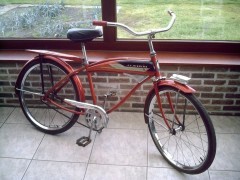 could not find a pic of a similar bike to compare. A very rare find here in Europe ! !